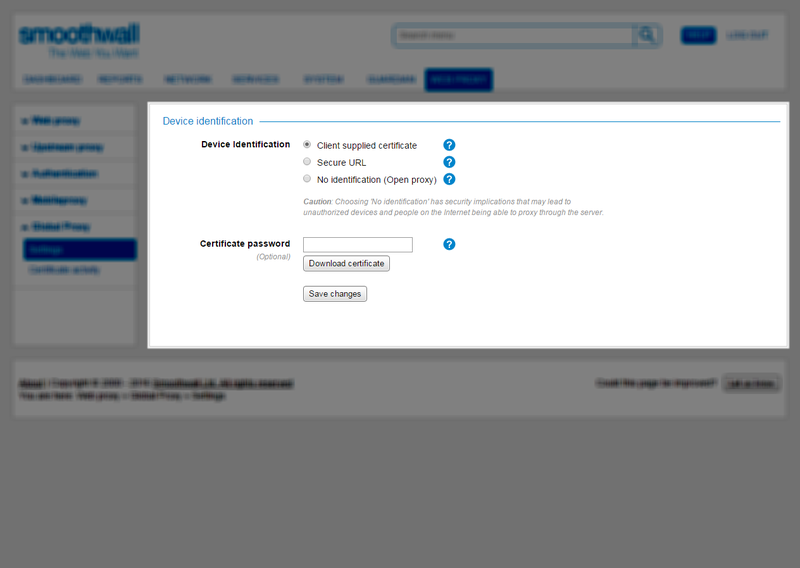 By default, the Smoothwall identifies connecting Global Proxy clients and devices using a client certificate. However, there may be some cases where it is not possible to issue the correct client-side certificate to every client and device on the network. The same certificate is used by all devices. You must download the client certificate from the Smoothwall responsible for Global Proxy requests, and install them on the relevant devices.  Create a web proxy authentication policy for Global Proxy using NTLM — see Creating Authentication Policies.  Set the Global Proxy devices' internal proxy settings to point to the externally resolvable hostname of the Smoothwall (which resolves to the external IP address of the Smoothwall), and the port number used for the Global Proxy using NTLM authentication policy. For example: https://mysmoothwall.com/800. Note that this must be on HTTPS and not HTTP.  Add the external address of the Smoothwall to the devices' internal proxy exception lists. This ensures the certificate validation requests are not proxied. 2. From Device identification, select Client supplied certificate. 6. Copy this certificate into the relevant devices' internal storage, and import it into the browsers. For a detailed description of supported browsers, and how to import the certificates, see About Global Proxy. Global Proxy servers which are part of a centrally managed solution should have the Certificate Authority uploaded to them via replication. If this does not happen, you should manually export, then import the Certificate Authority. Note: This option is recommended for Connect for Chromebooks configurations, where the Chromebook devices are used external to your organization's network. For those devices where it is not possible to distribute the client-side certificate to each individual network device, such as Chromebooks, you can use a secure URL to identify connecting Global Proxy clients. This is a secure alternative to the No identification (Open proxy) method of device identification — see below. 2. From Device identification, select Secure URL. 3. In the Query string text box that appears, enter the required string. Valid characters are: a-z; A-Z; 0-9. Non-latin ASCII characters, such as ÿ, or punctuation marks are not allowed. This ensures device identification is done immediately after opening the browser. It is not recommended you configure an unsecured (open) proxy as this has security implications. If you configure Global Proxy as an open proxy, device identification for connecting clients, whether by presenting a certificate or via secure URL, is not carried out — although NTLM authentication is still required. Open proxies allow all connection attempts through without device authentication, and can potentially be exploited by users, such as spammers. 2. From Device identification, select No identification (Open proxy).